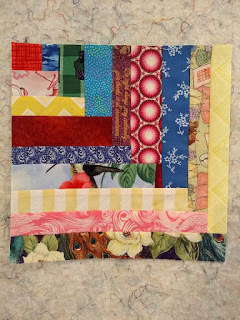 Kat & Cat Quilts: What to do with a modest baby? What to do with a modest baby? A friend of mine is expecting a new baby soon, and so far the little scamp has kept their bits covered during the ultrasounds. I suppose they are modest? 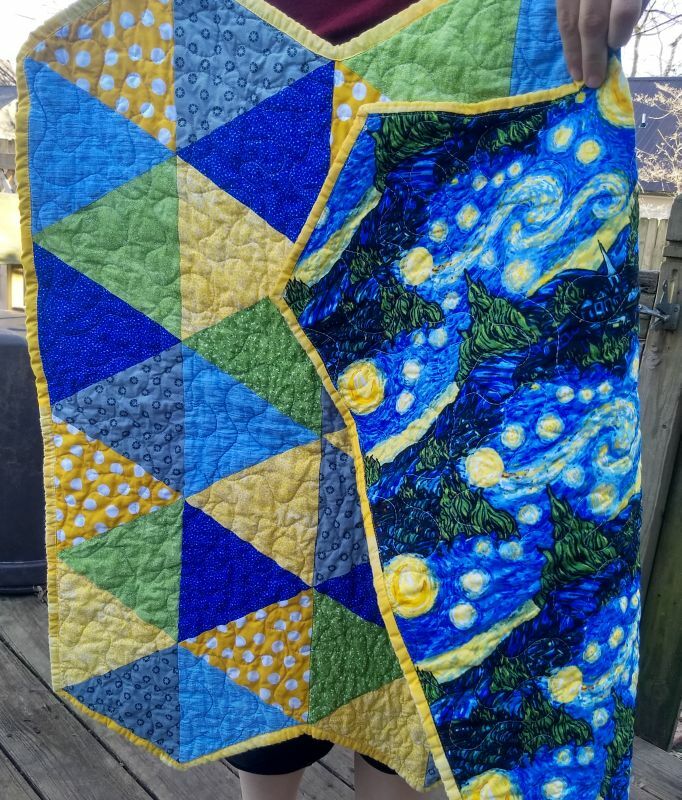 I started off to make a gender neutral baby quilt using my 60 degree triangle ruler and pulling a color scheme to match this Van Gogh fabric I've had a long time. In the end, I decided that one was too boy-ish. 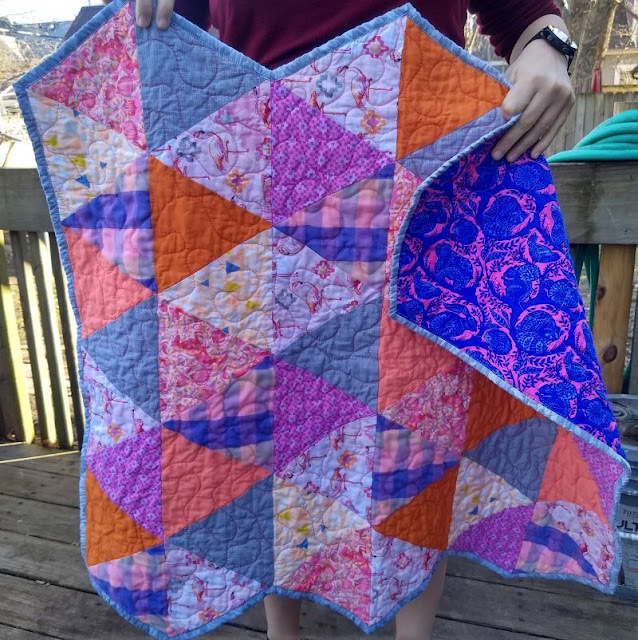 So I made a little girl quilt, pulling colors from a southwestern flamingo fabric I've had a long time. I think I must have found it in a remnant bin? I found a bunch of too-cute fabrics for the front and some fat quarters to make the backing. 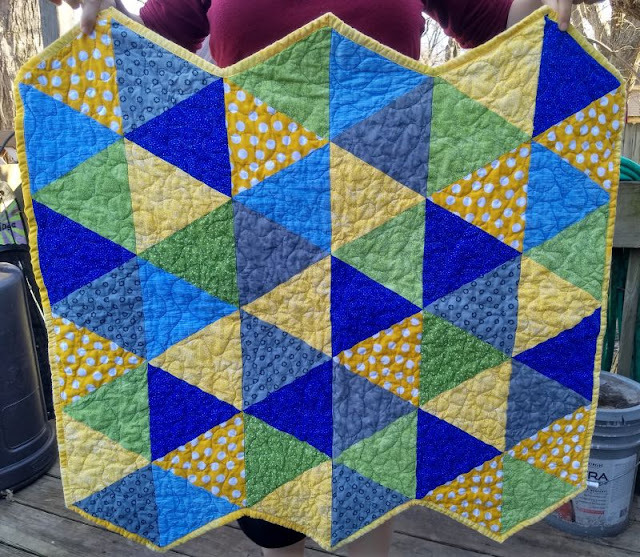 Once the mystery baby makes their debut the other quilt will be sent to Jack's Basket to celebrate another beautiful baby. I delivered the quilts, along with an addressed envelope for Jack's Basket, to the Grandma-to-be over Christmas so she can take them to the birth. When my brother's daughter-in-law was pregnant, her tech told her that she tells the gender of the baby by an extra bone in the scan of a baby girl - she does not look for the genitalia of the baby. And she was absolutely correct on her identification of the gender of the baby. I forget how old the little girl is now. I know she's at least in the second grade. Then when she was pregnant again, the tech (I don't know if it was the sam one) correctly identified boy/girl twins. Either way, beautiful quilts were made and will be put to good use! Thanks for sharing yiour beautiful work. I love your quilts and that edgy border is fabulous! I think they are both so colorful and fun. Either way this baby will have a wonderful gift. I have about 4 or 5 tops finished for Jack's basket. I just need to get around to quilting them. You've started me loving that organization. Thank you for sharing these beauties!! Those are both adorable - love that van gogh backing - its beautiful! Welcome back home & to sewing. Those two quilts are precious. I've never seen "ziggity zaggity" borders like that before. It really looks neat. Sounds like you had a great & relaxing holiday. 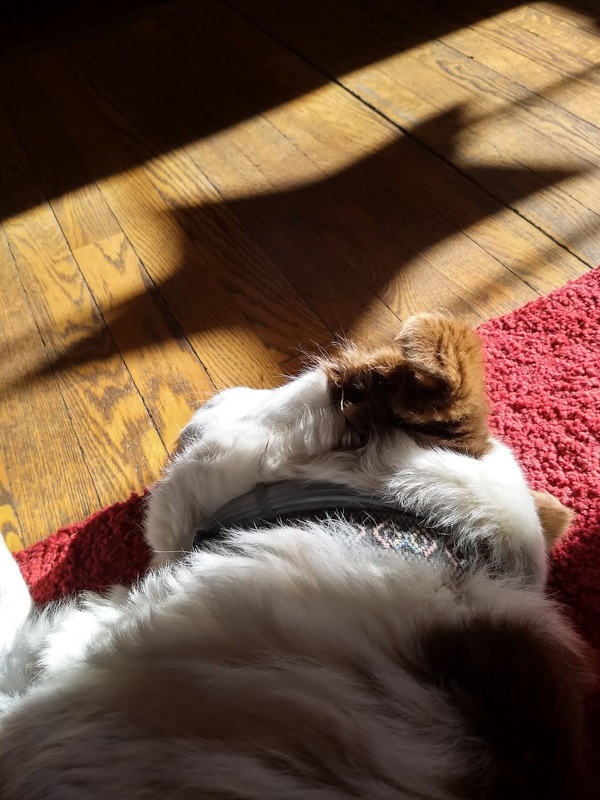 I'm loving that furry dog picture! Great idea - make two quilts and donate one to another baby. They are both bright and cheerful. I'm sure the baby and their grandma will love it! Lucky baby either way. 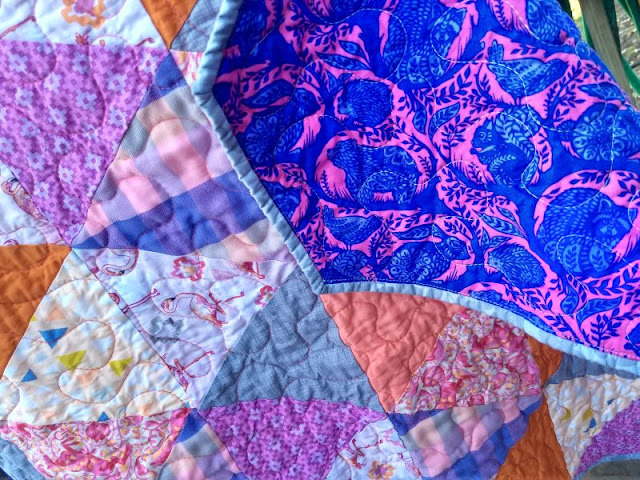 The quilts are both gorgeous!